There isn’t going to be a whole lot of instruction in this post, because it’s not really needed. To make the vessel sink, we used a serving bowl, a chrome pipe kit (similar to this) and sink drain. Buy a serving bowl that you can fit your hands in (you will look silly taking bowls off store shelves and sticking your hands in them—just like I did for several months). Drill a hole in the base of the bowl. What you use to cut the hole will depend on the material the bowl is made out of; ours is porcelain, so we used a carbide grit hole saw (examples here–affiliate links). Attach your pipes and sink drain per the instructions that came with the fittings. The Hubs did all of the work on this particular project since it really is one person job. The bowl was from Target, on clearance for $12. The faucet is from IKEA. We had a hard time finding any we liked that were actually made for vessel sinks, and they were quite expensive. So we went to the kitchen faucet department instead and not only did we like the looks better, they were nice and tall and they were cheaper! If you have any questions about the process, I will certainly pass them on to The Hubs! Did you need to seal the sink drain onto the serving bowl somehow, with silicone or something? Or did the drain come with somesort of rubber seal? I like the faucet and the whole sink is amazing, you are genious. Thanks! We are pretty happy with how it turned out. We did seal it. A rubber gasket came with the drain, but it was too thick for our particular bowl. So he used a plumbing sealant paste under the drain and we haven’t had any leaking yet! That is such a brilliant idea! I wish I would have thought of it! Hey Maryanne! I did try one product, and it hasn’t worked yet. We’re keeping at it though. I can’t wait until it’s done and I can share the pics! Hi Christina! I’m a fellow FPM Scavenger Hunter (I’m Ashley, player name BrooksEditorial), and I thought I’d pop over and say hi! I really like your blog! My husband and I bought a foreclosed home a little over a year ago, and the renovations have been SO MUCH WORK (but fun too!). Like you guys, we’ve DIY-ed almost everything. Hubby is a woodworker, so between him, both our dads, and our electrician friend, we don’t pay full price for anything 🙂 I’m looking forward to seeing more of your creative DIY ideas! That is one neat vessel sink! I’m thinking of remodelling our kitchen and vessel sink is a great idea however, i’ll be asking my husband to install the sink. I don’t think i can do it properly. I never thought a plain looking bowl will look beautiful as a sink! This is a good idea. 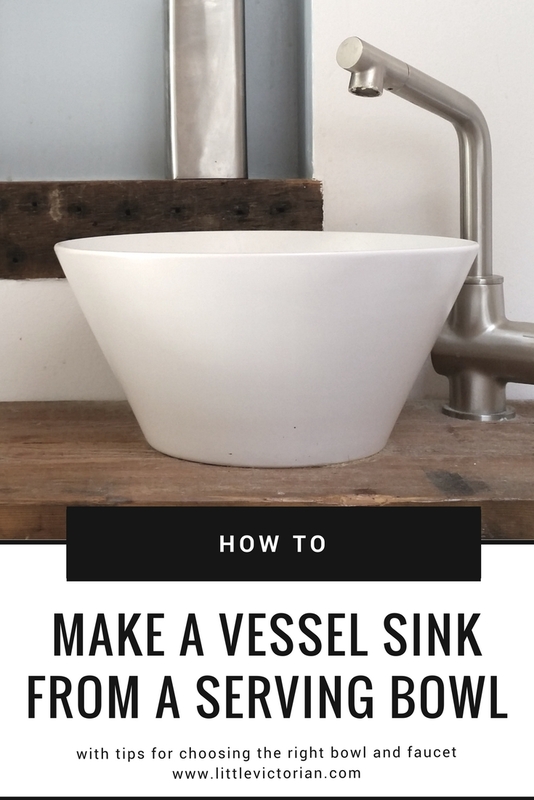 I have always loved the idea of vessel sinks. I think it’s time to make some bathroom makeover and put this vessel sink on the bathroom top! What brand of sink drain did you use? Hi Christina – What size hole did you cut? We’re thinking about doing this in our powder room and have all of the materials, but are just trying to figure out the hole! Hi Catherine! It depends on the size of your pipes. The drain pipe that comes out of the sink will have a rubber seal with it that will go between the pipe and the sink. You’ll want the hole in your sink to be slightly smaller than that seal. For our set-up, we used a standard vessel sink pipe kit from Home Depot, and a 2″ carbide grit hole saw from Milwaukee Tool. We also recommend some Real-Tuff thread sealant. It’s a paste that helps seal up plumbing and it works very well. Awesome. Just what I was looking for. This is a bathroom re-do we can afford. Thank you for posting this. Just found your website and am loving it! 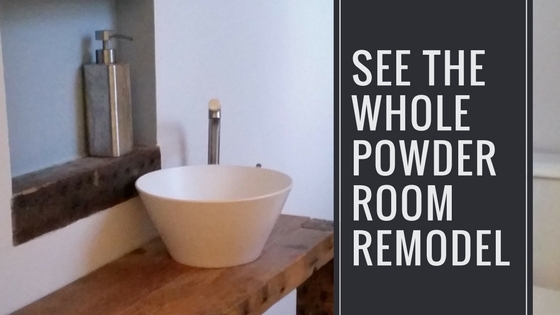 My hubby is wondering how your hubby constructed the powder room sink base from recycled wood. If he has a drawing or something, we’d appreciate it. We have a small bathroom with really no room for a sink and your sink base is PERFECT! Thank you Laurie! I will see if I can find it, if not we’ll make another one. Mind if I email it to you? Hi! Love the sink!! Did you countersink the drain hole for the lip on the drain? Thank you! We did not countersink it–we didn’t even think of that before installing it. But it has not been an issue, this particular bowl still drains just fine. Is it possible to get a pic of the carbide drill bit you used? Hi Jana, so sorry for the delay. We no longer have it, so I don’t have a picture, but this is the one we used. what size carbide grit hole saw did you use? Sorry, I don’t remember what size, it was several years ago now. It was based on the size of the drain assembly, so if you already have that, you can take it to the store with you to get the proper size. We just did this with a vintage Japanese bowl and while it is gorgeous, it isn’t very functional. I’m hoping you might have a suggestion. Our plumber installed the bowl during a bathroom renovation. The drain, however, is slightly ABOVE the bottom of the bowl. Sealed, so no leaks, but all the water doesn’t drain! Do you have this same problem? What does the bottom inside of yours look like? Thanks so much! Hi Jenna! So sorry to hear it’s not working for you! We occasionally had some slight puddling, but certainly not enough to cause an issue. I’d send you a picture, but we don’t own that house anymore. What other people have done to avoid the problem is had a little lip carved out of the bowl around the hole so that the drain would be recessed and sit level with the bottom of the sink. Did you guys cut the hole yourself or did the plumber do it? I love this post! I am sitting in France wondering why all of the vessel sinks here are so boring and/or so expensive, when I also had the idea to convert an old floral basin+pitcher set, which you can find in any flea market. My husband is still skeptical, but I think this is certainly worth a try. Thanks for reinforcing the inspiration. That’s great! Let me know how it goes!